Maradhi Manni: Forget Thackerays - Hail Jagani who is making a difference in the life of our farmers! Forget Thackerays - Hail Jagani who is making a difference in the life of our farmers! Mansukhbhai Jagani from Gujarat ploughing with his motorbike-turned-tractor. Drought, a scourge of humanity, makes living impossible for farmers, destroying land, men and farm animals alike. With the death of cattle, and lack of water for irrigation, ploughing barren fields becomes futile. Using his old motorcycle, the farmer developed a machine system called 'Santi' for small farm holdings, complete with attachments for tilling, weeding and sowing. Several farmers in the district have caught on to the idea, and there are now close to 40 Santis in the district. It costs between Rs. 14,000-18,000, making it much cheaper than other mechanical ploughs and it performs several functions such as weeding, ploughing and sowing for an acre. The machine proves to be cost effective and fuel efficient, can plough an acre of land in just half an hour consuming only two litres of fuel. Ten hectares of land can be weeded in a day and the cost of weeding is a mere eight rupees a hectare. With the help of National Innovation Foundation (NIF), Ahmedabad, Mr. Jagani got a patent in India and in the U.S. for this device. The knowledge and skill of this rural genius impressed everyone present. 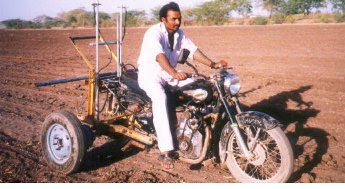 In fact, his motorbike-polycultivator is considered a typical example of a product with global applications. With design inputs from NID, Ahmedabad, help in patent-application-filing from Boston, U.S., based THT, law firm and business-plan development by Sloan School of Management of Massachusetts Institute of Technology, the innovation has literally gone places. Let us just hope that this useful invention becomes more popular throughout our country. The government can take some action in this regard. Edited (14.2.10): I was in a hurry on Friday when I posted this article. Came back today from Cuddalore and corrected the fonts, which was not looking nice at all! Sorry! That was very inspiring mami. Truly goes to show that there are so many people out there whose brainstorms change lives. Wow! That is indeed inspiring! Wish we had half the initiative shown by this man, in our so -called leaders! We would have a far better India then. Thanks so much for sharing this - we need people like this! We have a wonderful talent in the country.All it needs is encouragement.We seem to waste hours at no end on silly topics like SRK-SS stand of.Only if Jaganis of this world get a bit of encouragement. Thatz really inspiring Sandhya. Hw I wish all those who are elected in the name of our leaders think and be productive too! Loved this post... I love such stories... ! It is true that necessity is the mother of invention - this proves it right? Hats off to him. Such a refreshing post from the Thackeray-SRK drama. Anyone can do armchair activism but people like Jagani actually make a difference. Oh what a nice post...yes,you are right ,we have had just enough of Thackrey's.Thanks for sharing this because this news is new to me.Have a nice weekend Sandhya. thats so right Sandhya..we must right more about such people..they are truely ingenius. Many inventions that led to the advanced technologies of today were introduced during the world wars. Disasters like those, and droughts floods etc have spurned many people to invent simple yet efficient things that will make a difference in the lives of many more. Kudos to the real hero that you have mentioned and other such real heros who have the will and the spirit to fight. What an ingenious invention, Sandhya! It's nice to read positive news like this! Ashwini: Yes, you are right, Ashwini. Very ordinary people come out with such brilliant ideas and do not expect the world to praise them but go on with their work. Kanagu: Yes, everyone should appreciate him. Our country has got many people like him, but they stay in the background. wordsndreamz: True, Smitha, we need many many people like him, not dummy leaders. BK Chowla: I have not seen any TV channel showing him or his bike. This IS an important innovation, I feel. Swaram: Our political leaders think only about the votebank for the next election. They never bother about the country's future. hitchwriter: This story should have got more coverage, I feel. Radha: Yes, the outside world knows about him more. They say 'the innovation has gone places'. Solilo: Even MIT and other important institutions have hailed him. I was so happy to read this news and posted it in a hurry before leaving for outstation and corrected the fonts last night! Definitely, these people make a difference from all the paper mache leaders of ours. Kavita: Yes, I read this in the 'Hindu' for the first time. Renu: You are so right, Renu. Destination Infinity: Yes, people like Jagani are the real heroes. Manju: Yes, I am also happy to read news like this. I was very upeset reading about the bomb blast in Pune. When will these complex people stop hurting innocent people? These are the kind of people who are the revolutionaries... though in small steps, its a step towards progress..
What an inspiring article! I wish our beloved leaders take some inspiration from Mansukhbhai Jagani. We need people like him. Thank you for this post,Sandhya. Pixie: Yes, 'though in small steps, its a step towards progress.' so true, Pixie. Ramesh: Yes, we should be ashamed of ourselves for cribbing about small small things, Ramesh. At last you are 'reading' and commenting in my post, thank you! Deepsspeakingup: Yes, we need more people like him, Deepu. Ramesh: Forget it, it's a joke! You were just acknowledging my comment on your post in my post!! Ippa maaritteenga...nalla paiyyan! Oh, ippa naan paatti maathiri feel panren!